As summer ends the garden can begin to look tattered and dull. Add a pop of color with a piece of sculpture, glass, fountain, or found item that reflects your personality. 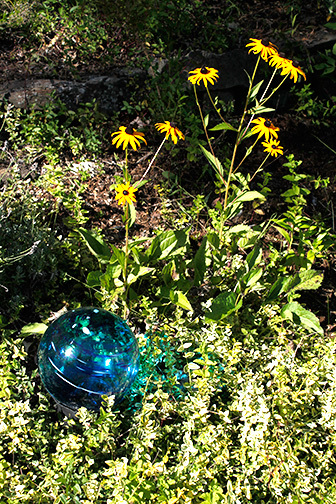 Here a blue gazing ball works well with gold Rudbeckia in a bed of Golden Euonymus. This is also the time to order spring bulbs such as daffodils or tulips. This is the time to start thinking about landscape design for next year. Fall is the perfect time to hire a landscape designer so the garden can be planned over the winter and ready to install in the spring. Plan ahead- call 603-315-9851 to make an appointment with Sally Turner today.